The organ was originally installed in the Gaumont Cinema, Oldham, Lancashire. It was opened on 14th June 1937 with Jack Fenner at the console. The specification for this Wurlitzer was drawn up by Quentin Maclean and only two of this style of organ were made for Hyam’s Gaumont British, the other being for the Gaumont Cinema in Watford, Opus 2207. The Gaumont eventually closed on the 2nd December 1961 and the organ purchased by the Cinema Organ Society. The organ’s first new home was the Dale Hall at Hampsthwaite, near Harrogate, North Yorkshire. It took four years to install the organ and it was heard for the first time in public on the 26th February 1966. The organ stayed in this location for 22 years and was used for concerts and private practice. One young player who used it for practice was Phil Kelsall. The final concert at Hampsthwaite was on the 3rd December 1988. The organ was then installed in the Trinity Arts Centre in Pudsey, a suburb of Leeds, where it was opened on the 30th June 1991, but unfortunately this venue did not live up to expectations and by December 1994 removal commenced. Successful negotiations enabled installation to start at the Ritz Ballroom in Brighouse. This former cinema was built with organ chambers at either side of the proscenium, together with decorative plaster grilles, fronting the chamber shades. However, despite this, no organ was installed until the COS arrived in 1995. Shortly after the installation, opportunity was taken to enlarge the organ with the addition of a Tuba Horn in the main chamber and an Orchestral Oboe in the solo chamber. This provided a greatly enhanced stop specification. For various reasons, the organ was removed from the ballroom and placed in storage in 2006. The organ’s latest home is the Victoria Hall in Saltaire, The Hall is a grade 2* listed building, and is located at the centre of Sir Titus Salt’s historic village, designated a World Heritage Site. The Victoria Hall was opened in 1869 as a place of recreation, culture and learning for the local community, and the main hall has a sprung dance floor with 10 metre high ceilings. The organ was installed in the hall and opened on 12th April 2009. It speaks from two chambers situated under the stage while the Wurlitzer console is on a hydraulic lift which raises it to stage level. 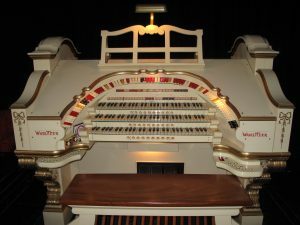 When installed at Saltaire a Wurlitzer English Horn was added that came from Opus 2209, the Metro Theatre Durban, South Africa. In 2017 we added a Wurlitzer Krumet, with a new specification drawn up by Simon Gledhill.